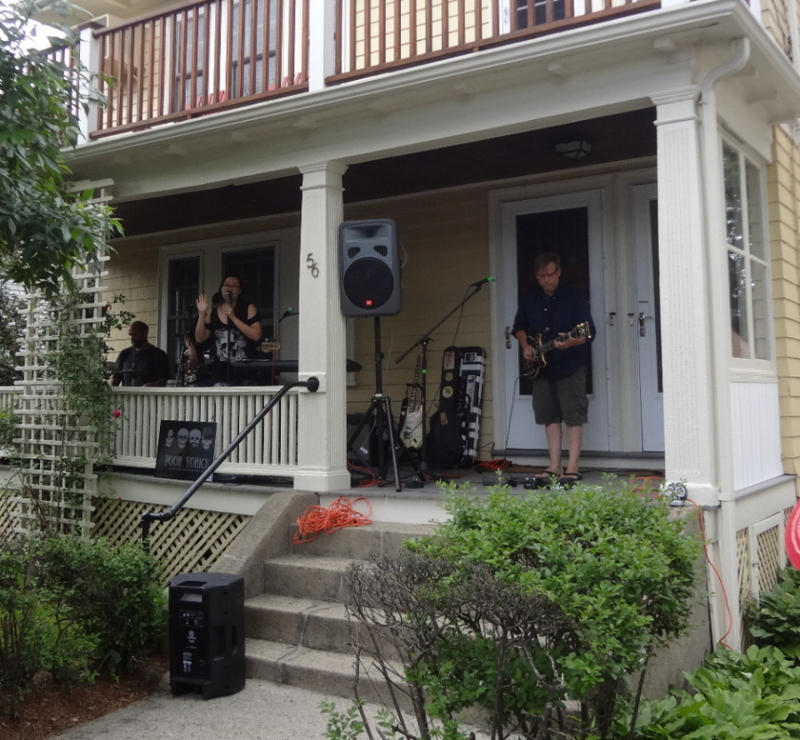 The Arlington Center for the Arts’ second annual porchfest event, featuring bands performing on porches around town, was divided into two segments, from 12:00 to 2:00 in Arlington Heights, then 2:00 to 6:00 in East Arlington. I made it to the East Arlington portion of the program. I had two performances in mind for this event, and neither artist disappointed. In between and briefly afterward, I walked the streets of Arlington and caught some other good music, as well. 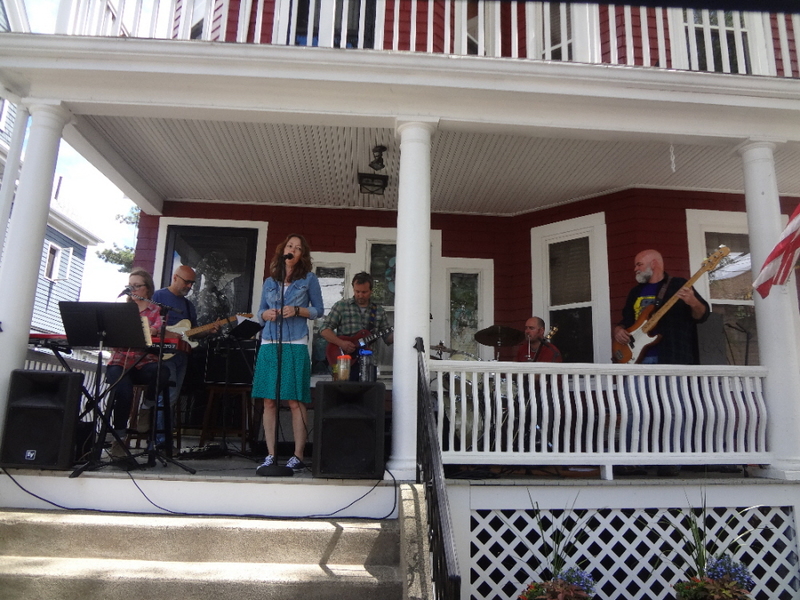 My first porch of the day was inhabited by The Stacking Stones Band. The first targeted band of the day, I had been trying to get out to see these guys for at least a year, so I jumped at this opportunity. I stayed for eight songs and heard a blend of blues, rock, and just a hint of folk-country in the band’s musical mix. They kicked off with “So Familiar,” which displayed a little distorted, somewhat psychedelic blues-rock guitar and a hint of Joplin in the otherwise bluesy vocal, with a slow blues-based rock rhythm. Also worth noting was “You & Me,” a hooky, medium-fast tempo blues-rocker that carried a hint of a “Sweet Home Alabama” vibe, “Roses All Around You,” which could’ve been the musical sibling of CCR’s “Fortunate Son,” and the band’s rendition of “Tulsa Time,” with showcases some terrific vocal harmonies and a really countrified guitar part. The band closed its first hour with a cover of Waylon Jennings’ “Lonesome, On’ry and Mean,” showcasing its harmonies, a crunchy guitar line, and powerful vocals. A tight unit with some well-written originals whose performance carried a fun vibe, I look forward to my next encounter with The Stacking Stones Band. Later in the day, I made my way over to see my other targeted performer of the day, Samantha Farrell. 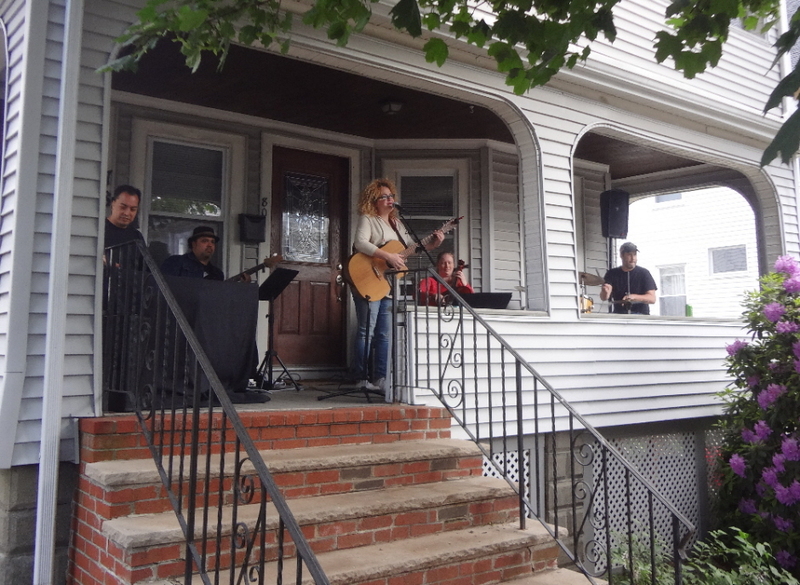 When I arrived at Samantha’s porch, I caught the last song-plus of Greg Klyma‘s performance. I didn’t take any notes as I was getting settled in, but I was impressed my Greg’s strong voice and performance style and plan to review his summer album release, so watch for that in the blog in the coming months. When Samantha Farrell finally began to sing, just wow. She has a voice and a performance style that enthralling and amazing at the same time. At times during the performance, she’d hit an amazing note, and I’d glance over at some of the other vocalists in the audience who would be shaking their heads in amazement, knowing they’d only be able to sing like that in their dreams. Her vocals seem rooting in jazz with elements of torchy standards, blues, and vocally-powered pop ballads. When she was singing “Let It Go,” for example, her power vocal contained that sort of torchy blues-pop edge reminiscent of Elle King. “September Sun,” with kind of a jazzy, folky feel, utilized her strong, powerful, very high vocal. “Tuesday Night” was also very jazz-based – sophisticated, cocktail lounge fare that featured a crisp, strong vocal from Samantha that would cut through pea-soup fog. And at the end of her set, the slow, rich sound of “Fade Away” featured extremely well-placed cracking of her vocal. Simply, holy cow, Samantha Farrell is a powerhouse singer with few equals. In between (and on the walk back to my car afterwards), I caught a few other bands worth mentioning. Poor Yorick was just a few houses down from The Stacking Stones Band, and because both bands were fairly high-volume, the two bands made a deal to pass the performance back and forth every four songs and shared each other’s audiences. Riding powerful vocals and psychedelic rock guitars, the band blasted through its set, for the most part. They kicked things off with a cover of “Come Together” that was all parts psychedelic hard rock, sporting strong vocals and shredding axework. “The Love Cats” was a funky and somewhat theatrical number. And also worth noting was a song that was a mild departure, a straight-up rock version of “Don’t You (Forget About Me)” that was obviously heavier than the Simple Minds original but performed by the band as the least-heavy rocker of its first set. 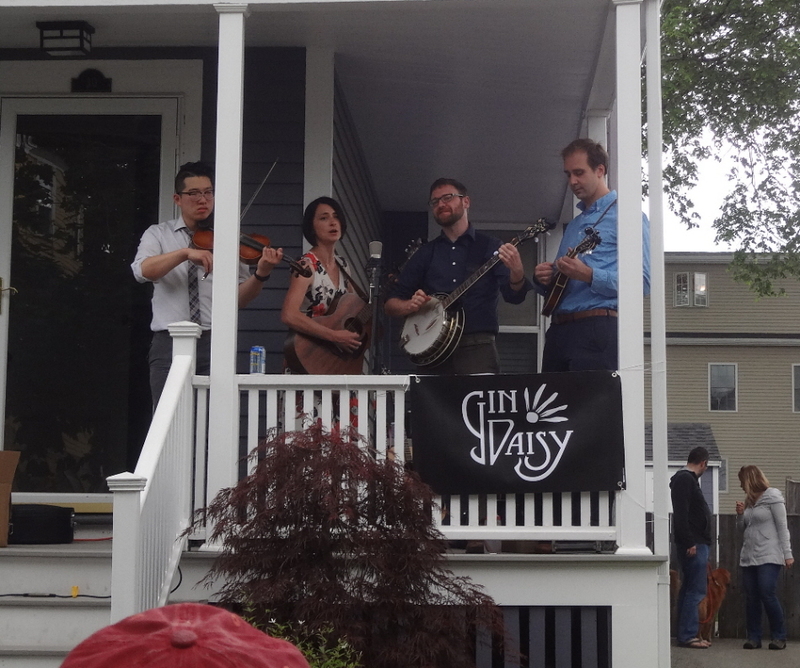 On my way up Cleveland Street, I stayed for a few very cool songs from local bluegrass band Gin Daisy. 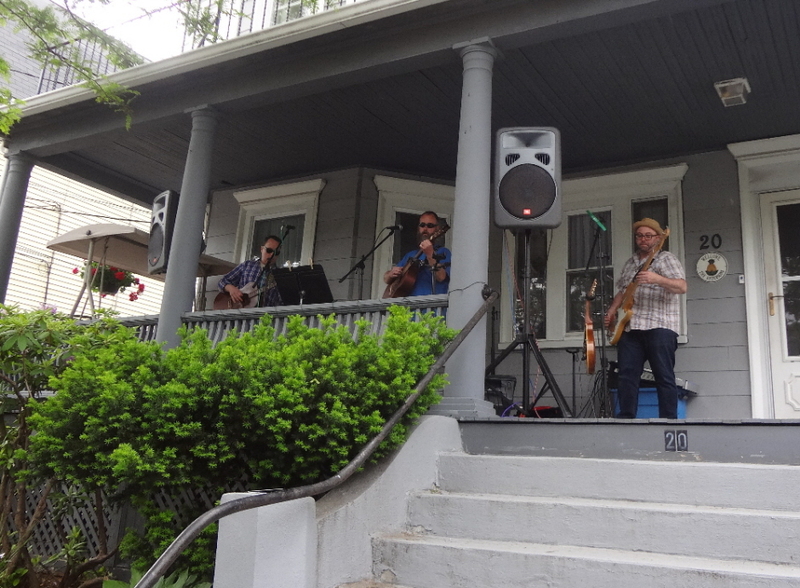 As I approached their porch, the band was deploying great blended harmonies and some serious pickin’ from the entire group – well, technically the fiddler was bowing, but still. I stayed through an old-school bluegrass number, a square-danceable song that would’ve been good barn-raising music, and an interesting arrangement of “Midnight Special” that varied tempoes throughout. I don’t know this genre well, but I do recognize talent, and Gin Daisy has that in spades. I caught a few songs from 25 Pearl. My first impression was ’70s classic rock meets ’70s folk in a blues club. The songs carry a kind of dark flavor and perhaps a harshness and aggressiveness unusual for bands that blend the rock-folk-blues elements employed by 25 Pearl. Dylan meets classic rock at a Tom Petty concert, performed with a uniquely erratic nature. Finally, on my way to my car from Samantha Farrell’s porch, after a late-afternoon passing rain shower chased a lot of people away and convinced many bands to shut down a half-hour before the fest’s end, I did run across a few performers continuing their performances. One that caught me ear enough to get me to stop and listen was Casey LJ. I was able to enjoy his final four songs, all performed with a unique charisma and a vocal tone that I can’t quite describe as a drawl. He kept his crowd happy with extremely entertaining renditions two Eagles tunes (“Desperado” and “Heartache Tonight”), The Who’s “Squeeze Box,” and the Grateful Dead’s “Deal.” It was a great way to end a fun afternoon. 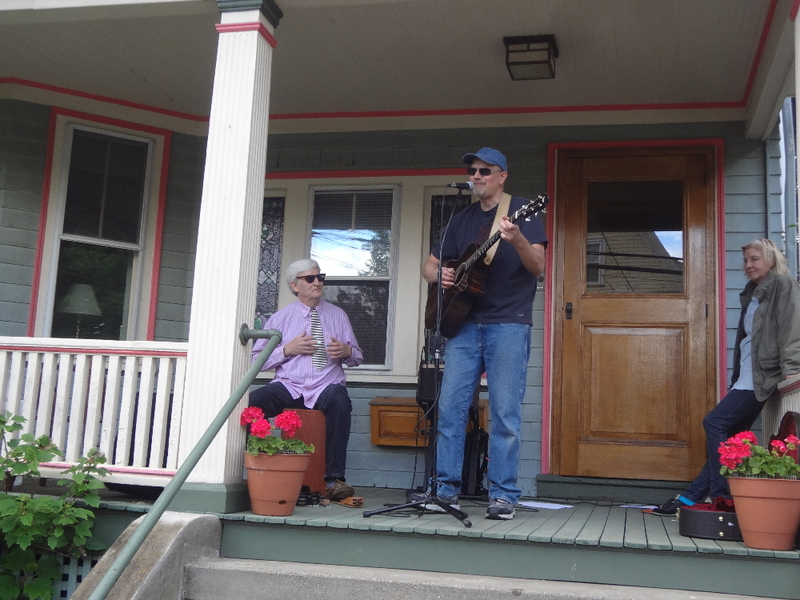 Indeed, my first porchfest of any kind, Arlington’s was a lot of fun. Unlike some of the more inner suburbs, on-street parking (especially for those of us who arrived before the performances started) was easy, plentiful, and legal, in part because we weren’t competing with residents, as the homes had driveways. But there were plenty of participating porches within easy walking distance of each other – even easier for the attendees who brought their bikes. Conceptually, it’s a neat event and a great way to hear a variety of music on a pleasant afternoon. 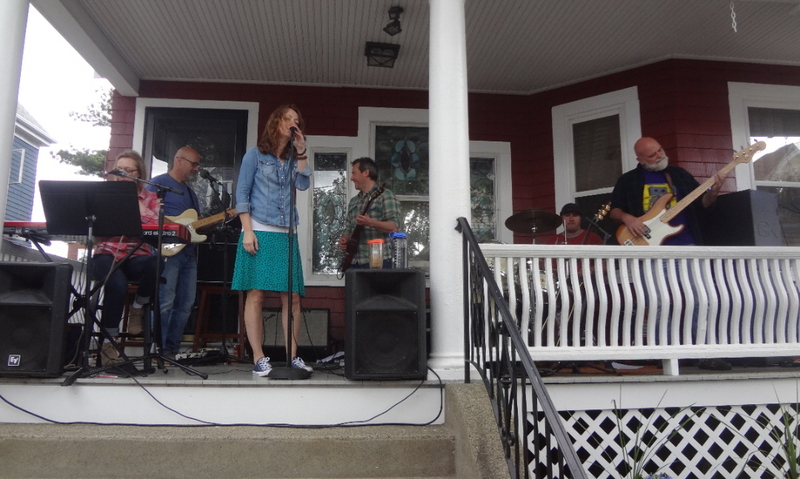 This entry was posted in Live Reviews and tagged 25 Pearl, Arlington Porchfest, Casey LJ, Geoff Wilbur, Geoff's Night Out, Gin Daisy, Live Review, Poor Yarick, Samantha Farrell, The Stacking Stones Band. Bookmark the permalink.